A recent review of the new Manic Street Preachers single speculated that the band’s consistently good press coverage is due to a disproportionate amount of 30-something music journalists who over-romanticise the firebrand, iconic acts of their youth. Even bass player and propagandist-in-chief Nicky Wire thinks there’s something in this. “We’ve never inspired anyone really, band-wise,” he says, “but we’ve inspired lots of journalists and academia and people doing PhDs on RS Thomas.” Even with that caveat in mind, their latest album, Futurology, has received notices it’s impossible to downplay. Their twelfth record follows less than a year after their eleventh, the introspective, downbeat Rewind the Film and is everything that album wasn’t. Where the former was a mostly acoustic inward sigh, focused on, as Wire puts it, “midlife, staring in the mirror, RS Thomas, myself and my country... it’s all over”, its successor compliments it in opposition: electronic, punkish, and outward facing, it sees its creators inspired not by their own shortcomings and fears, nor largely by their anger, but by creativity, energy and movement for their own sake, a “celebration of ideas” according to Wire. It’s an album steeped in Art and affirmation. While Rewind The Film was a strong record, it’s also one that made sense from a forty-something Manics, lost in sepia and faded melancholy. Futurology is all primary colours and speed and few of us saw it coming. From their dark masterpiece, The Holy Bible, to 1996’s lurch from brutal nihilism to stadium triumph with Everything Must Go, to following their “big, crowd pleasing comeback record” Send Away the Tigers with an art-rock project in Journal For Plague Lovers, to Nicky Wire making a solo album, the Manics have always gloried in wrong-footing everyone, in being the version of themselves we least expect. Futurology feels part of that shifting process - few bands can be galvanizing on their twelfth release. ”To understand your country you must understand yourself” writes Wire on ‘Misguided Missile’, and it serves as a shorthand to the album itself. The soul of the record really comes from a vacuum, and what rushed in to fill that vacuum. To understand Futurology, you also need to understand that to get there the band had to jettison the old version of themselves as a mega-selling Oasis-level indie-rock band. Their tenth album, 2010’s Postcards from a Young Man, was constantly touted by Wire as “one last shot at mass communication” (a PR line that Bradfield reckons he was against all along), the last time they’d aim for the stadium hits and arena tours. They underlined it with a singles collection the following year, and that was that - double underline. The Manics wanted to be something else entirely. The conscious break from their history mirrors a more gradual evolution happening in the band anyway, as the traditional tropes of the Manic Street Preachers got shot down one by one. The typical view of a band with Bradfield and drummer Sean Moore as the musical wing, with Wire as the tone-deaf lyricist who once rated himself “nought out of ten as a bass player” is simply not true any more. These days Bradfield will quietly pen the lyrics for at least one song per album( ‘I Think I Found It’, ‘Anthem for a Lost Cause’ and ‘Next Jet to Leave Moscow’ on their last three), whereas Wire now writes and arranges songs in their entirety, music and lyrics, and 25 years of constant playing has made him more than a competent bass player, writing fluid and quite funky parts that are more sepia-tinged Motown than they are punk. Bradfield may still do the lion's share of the singing, but across recent records he’s been joined by a succession of duets (including Ian McCulloch, Richard Hawley, Lucy Rose, Cate Le Bon, Green Garside and Georgia Ruth), while Wire is doing more lead vocal parts himself. The double album concept was rejected in favour of two very different records, though actually the two become such a black mirror for each other, working so well in opposition, that they actually form a satisfying pairing all the same (“more by accident than design” says Wire). While the Rewind the Film material was focusing on more classic Manics tropes of personal alienation and decline, themes Wire had been mining since at least the weary This Is My Truth, Tell Me Yours in 1998, if not before, the album that would become Futurology was energising the band in new ways. An extensive tour around mainland Europe, the former Eastern Bloc and Scandinavia was creating a sense of movement and speed that was bleeding into Wire’s themes, as the optimism and art of those countries, especially the futurist movement became a major source of inspiration. And there’s the rub, because as we said before you can see the origins of Futurology as coming from a position of vacuum. A band who always had so much to say about -everything- finding themselves in the position where they no longer know who to root for. There’s plenty to complain about, but very few solutions, and that’s not a satisfying position to write from. The ideas in the politics of British life can no longer fuel a Manics album, which has left room for the bold colours of modern art to explode in Wire’s head. You can hardly be surprised that their relationship with British politics has crumbled so much; as last year's ‘Thirty Years War’ proved, all Wire has left now is anger and sadness on that front, and recent trips through what The Guardian optimistically refer to as ‘The New East’ (former Eastern-bloc countries), and their famous, flawed trip to Cuba to launch the Know Your Enemy album in 2001 must surely affect their relationship with socialist ideals? 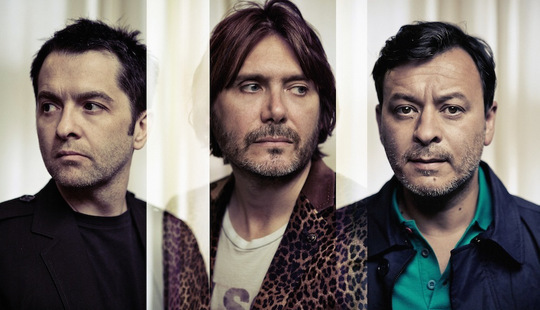 The vacuum left by political idealism, and by the concrete knowledge of what kind of band they were for the best part of a decade has been filled by a glowing excitement in ideas, and it’s that, more than anything else that makes Futurology such a turning point for the Manic Street Preachers. Maybe the creative reboot implied in Futurology isn’t quite such a new thing after all? The politics of disenchantment and the glory of artistic revolution? Come to think of it, that’s been the Manic Street Preachers all along.